America’s Got Talent: The Champions contestant and sepsis survivor, Angelica Hale, debuts No Time to Waste music video during Sepsis Survivor Week in solidarity with her fellow survivors. Almost 60% of survivors experience worsened cognitive (mental) and/or physical function. "I hope my music video inspires other sepsis survivors, or anyone going through a hard time, to keep fighting and never give up,” said Angelica Hale. In honor of the 1.4 million Americans every year who survive sepsis, Sepsis Alliance designated the 2nd week in February as Sepsis Survivor Week. This year, Sepsis Survivor Week will be observed from February 10th to 16th. During this week, Sepsis Alliance is partnering with sepsis survivors to shine a light on the physical, mental and emotional challenges many survivors face every day. In the United States, sepsis takes a life every two minutes. Fortunately, millions more survive, but almost 60% of survivors experience worsened cognitive (mental) and/or physical function. In a tribute to her fellow survivors, Angelica Hale, who survived sepsis when she was four years old, released a music video for her single No Time To Waste. The music video was jointly released on Angelica’s and Sepsis Alliance’s YouTube channels for Sepsis Survivor Week. About one-third of all sepsis survivors have another hospitalization within three months of their sepsis diagnoses. Among pediatric sepsis survivors, almost one-third are discharged from the hospital with some disability, including cognitive or physical impairments, skin grafts, amputations, or hearing loss. Older sepsis patients experience, on average, 1 to 2 new limitations on activities of daily living (e.g. bathing, dressing, managing money) after hospitalization. Sepsis Alliance is inviting sepsis survivors to share their survivor stories on social media using the hashtag #SepsisSurvivor and tagging Sepsis Alliance at @sepsisalliance. Sepsis Alliance developed a Sepsis Survivor Week toolkit to help sepsis survivors, loved ones, and anyone that supports survivors raise awareness. The toolkit can be downloaded at http://www.sepsis.org/sepsis-survivor-week-toolkit/. This toolkit includes shareable infographics, an informational video, printable materials, and more. To access resources and information for sepsis survivors visit http://www.sepsis.org/life-after-sepsis/. 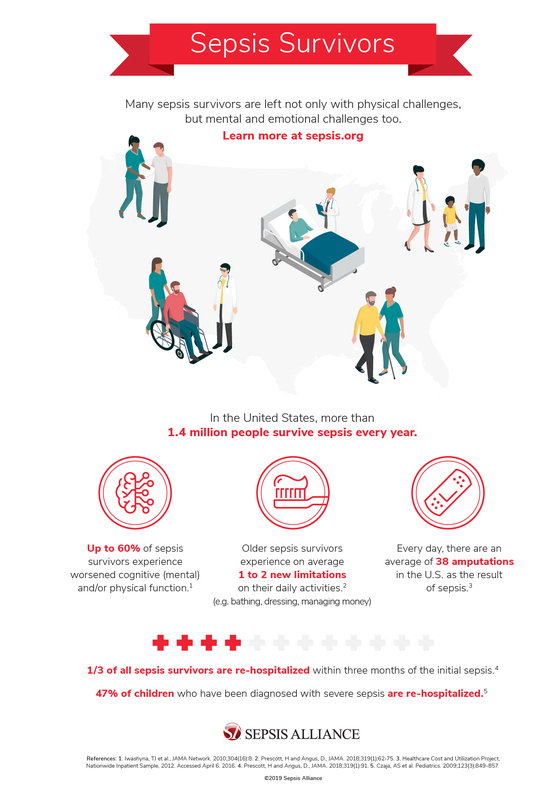 Sepsis Alliance is the leading sepsis organization in the U.S., working in all 50 states to save lives and reduce suffering by raising awareness of sepsis as a medical emergency. In 2011, Sepsis Alliance designated September as Sepsis Awareness Month to bring healthcare professionals and community members together in the fight against sepsis. In 2018, Sepsis Alliance created the award-winning national campaign, It’s About T.I.M.E., to educate the public about the signs and symptoms of sepsis and to highlight the urgent need to seek treatment when symptoms are recognized. Sepsis Alliance gives a voice to the millions of people who have been touched by sepsis – to the survivors, and the friends and family members of those who have survived or who have died. Since 2007, sepsis awareness in the U.S. has risen from 19% to 65%. Sepsis Alliance is a GuideStar Gold Rated charity. For more information, please visit http://www.sepsis.org. Connect with us on Facebook and Twitter at @SepsisAlliance.